The O-bar is one of West Hollywoods hottest spots. The fabric draped cabana-esque booths indoors and the sweeping vistas of the lush "forbidden garden" outdoors provide an extraordinary and enchanting ambiance. Try the tuna tar-tar or the pan roasted salmon. Feeling beefy? Try "The O-Burger". The O-Bar offers an abundance of specialty drinks, including the Apple/Ginger martini, the Missionary Style standard mojito, and the Filthy Girlscout, a frozen concoction made with oreo cookies. Cocktail Hour is 6:00 pm - 8:00 pm daily (bar service only), with drinks at half-price. The O-Bar does cater to gays, but they definitely do not discriminate. 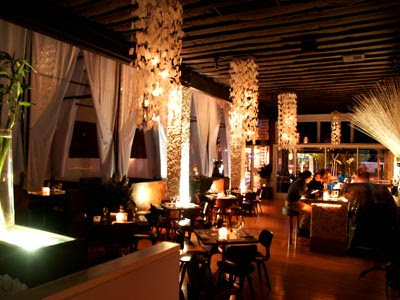 If you are looking for great drinks, great food, and great ambiance, swing by The O-Bar, located at 8279 Santa Monica Blvd in West Hollywood. Click the title link or call (323) 822-3300 for more info.